Location Abbreviations/Explanations: CMP (town of Cape May Point), CMPSP (Cape May Pt. State Park), Cove Pool (boardwalk and adjacent marsh/pools, accessible from the west end of Mount Vernon Ave in Cape May), SCMM (South Cape May Meadows), SHPt (Stone Harbor Point). Unfortunately, Mute Swan numbers held strong at CMPSP's Bunker Pond-- over 40 individuals remained through the period (m. ob.). Gadwall continued to be seen in small numbers between Cove Pool and CMPSP; at least one family group with 3 ducklings continued in the area of SCMM/CMPSP through 24 Jul (VE, TR). CMP's summering Black Scoters remained a constant sight through the week, though recent totals were not available. At least 3 Surf Scoters continued to be seen with this group (m. ob.). 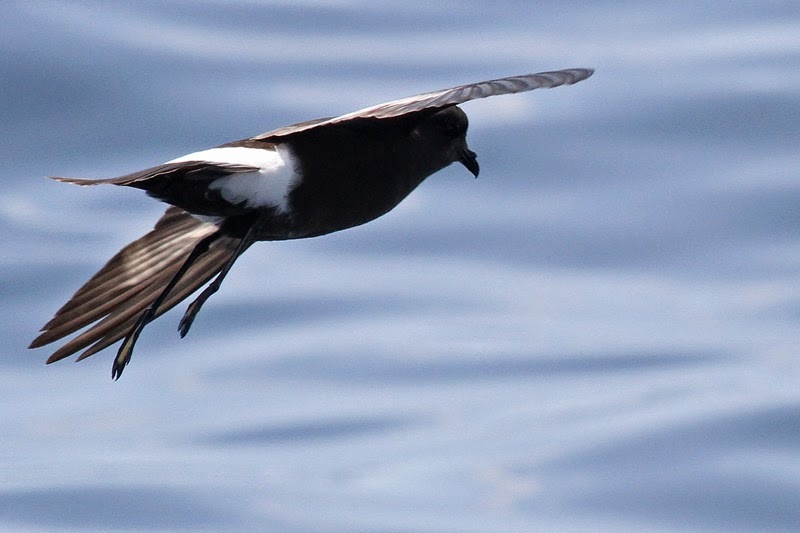 Land-based reports of Wilson's Storm-Petrels were in decline from earlier in the month, but whale-watching trips and ferry crossings encountered a handful of birds in nearshore waters most days (m. ob.). Small numbers of Brown Pelicans were noted along the barrier islands and at Cape Island most days (m. ob.). A collection of 9 Tricolored Herons along Stone Harbor Boulevard made for a nice tally 24 Jul (KH), and another small influx of Great Blue Herons arrived at Cape Island with the latest cold front 24–25 Jul (m. ob.). Also undoubtedly front-related, an imm. Mississippi Kite put in a brief appearance over CMP 25 Jul (TR, JA, RC). 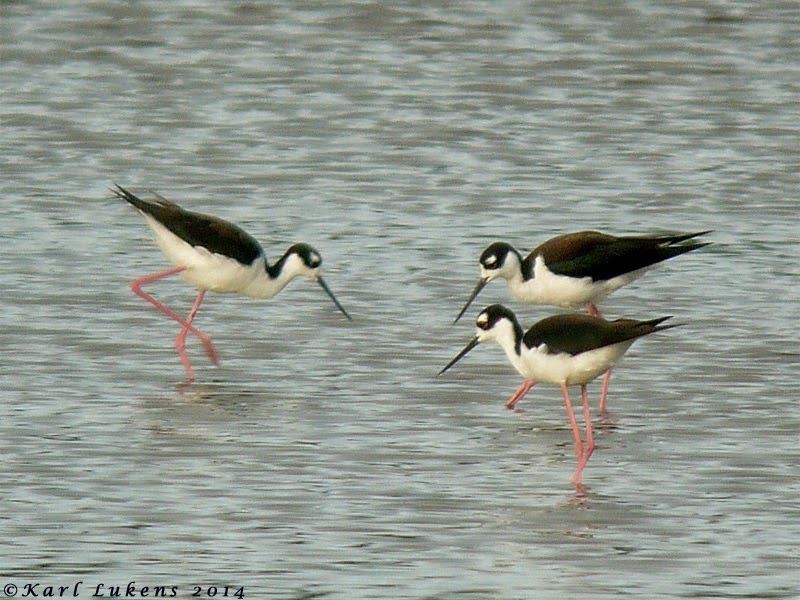 Very rare outside of spring, a trio of Black-necked Stilts found their way to SCMM 20 Jul (m. ob.). Whimbrel were on the move during the evening hours 23 Jul, including 54 that flew over SCMM (SR, TR), and 30 seen from SHPt (KK, DR). SHPt was also home to approximately 250 Western Sandpipers, 250 Semipalmated Plovers, and 13 Western Willets on 23 Jul (KK, DR). Southbound arrivals included a Long-billed Dowitcher over SCMM 23 Jul (TR), and a White-rumped Sandpiper at Pierce's Point the same day (TB). Scarce in midsummer, a Parasitic Jaeger briefly pursued terns and gulls offshore SCMM 24 Jul (TR). There was a slight uptick in Ring-billed Gull reports during recent days, as individuals began to filter south from the Great Lakes and Canada (m. ob.). Lesser Black-backed Gull continued to maintain a heightened presence along oceanside beaches-- a minimum of 10 could be found between SCMM and CMPSP most days (m. ob. ), and 6 were noticed at SHPt 23 Jul (KK, DR). Gull-billed Tern is scarce along the bayshore marshes; a single at Reed's Beach 22 Jul is worth mentioning (TR). Another was reported from the marshes near Avalon 23 Jul (MG). There wasn't much news regarding breeding birds this week, but the southbound movements of a growing number of species continued to unfold. Following the passage of a cold front 24 Jul, the morning of 25 Jul brought a fair number of swallows past CMP, including 250+ Barn Swallows, 25 Bank Swallows, and 2 Cliff Swallows (m. ob.). Songbirds were also on the wing the same day, with 150+ Yellow Warblers seen around Cape Island (m. ob. ), including 79 engaged in "morning flight" over CMP (TR). Other early-season migrants recorded 25 Jul included Louisiana Waterthrush, Black-and-white Warbler, and several American Redstarts at CMP (MC, TR), along with a Worm-eating Warbler at Higbee Beach (BR). A curious event involved an estimated 2,000 Red-winged Blackbirds that moved past CMP 25 Jul (RC, VE, TR). Most of these appeared to be juveniles. Jesse Amesbury (JA), Tom Baxter (TB), Mike Crewe (MC), Richard Crossley (RC), Vince Elia (VE), Mark Gallagher (MG), Kathy Horn (KH), Kevin Karlson (KK), Tom Reed (TR), Bill Roache (BR), Steven Rodan (SR), Dale Rosselet (DR). *eBird. 2012. eBird: An online database of bird distribution and abundance [web application]. eBird, Cornell Lab of Ornithology, Ithaca, New York. Accessed 25 Jul 2014. Available: http://www.ebird.org. A series of coincidental, unrelated events and emails have stumbled or snuck into my life of late, and reaffirmed with me something that is a basic essential of life - to see the bigger picture you have to join the dots. If you take each event or decision in your life in isolation, the full significance may be lost, but if you pull it all together - join the dots - things are placed in context and the bigger picture comes looming at you, crystal clear. After a summer that has seen Lake Lily's Mute Swans make the headlines when they started killing each other, Bunker Pond at the state park continues to collapse as a living ecosystem and our coastlines produce ever fewer beach-nesting birds, it has at times been difficult to press on. Sometimes it's all too easy to feel like a lonely voice in the wilderness, shouting oneself hoarse while facing a solid brick wall. But there is hope; there is an incredible army of people out there who are now calling "Foul! "; who now recognize that it's time we took stock of our surroundings and how we treat it. Just this morning, I received two emails that were totally unrelated, but which follow a common theme if you join the dots. The first came from John Cecil, New Jersey Audubon's Vice President for Stewardship, and included a link to an online article in northjersey.com. This article, by Bergen County Audubon Society's Don Torino, points out some of the common misconceptions people have about so called 'good' and 'bad' birds. In particular, Torino highlights the problems with Canada Geese in New Jersey - a native species, yes, but one that is not naturally resident here, but which was ill-advisedly deliberately established here for the 'pleasure' of shooting. The article uses straight-talking and facts and is non-emotional. The second email came from the Xerces Society, an organization that champions the cause for our beleaguered native insect populations. Concern continues to grow over the continuing decline in numbers of our pollinator insects, and if you think they are not important, think of all the food we eat that needs to be pollinated before fruit will form (grapes, apples, pears, peaches, cherries, plums, tomatoes, strawberries, peas, beans, blueberries, cranberries and many, many more). But the Xerces Society offer hope in their latest news item entitled 'Pollinators go to Washington'. More dots to be joined here, as the Xerces Society demonstrate that it is through our legislative system that we have the best chance of really turning things around - and New Jersey Audubon are certainly at the fore here, through Kelly Mooij and her team at the Trenton Policy Office. Joining the dots again, we can support our lobbyists in getting legislation changed to protect our wildlife and the environment, but I think we have to do our bit too. When I was a child, I think I was in the first generation of kids that didn't learn much about the environment from their parents; now, a couple of generations on, we are paying for that legacy. Time was when kids learned what to touch and what not to touch from their parents; kids learned what wild foods could be harvested and how to recognize them, and they learned how to live 'within' their environment. Of course, pushing back the boundaries of technology and improving our lives is a good thing, but thinking that it means that we don't need to care about our environment, or that the environment is not 'relevant' to those who live in cities is not a good route to travel down - and is patently not true. So we all need to do our bit to understand it a little too - and perhaps the biggest issue we need to get over here is that of what we can trust and what we can't. The internet is full of so much nonsense about the environment and wildlife in general that it can be almost impossible to know what to believe and what not; witness, for example, the storm being whipped up as informed conservationists attempt to save eastern North America's failing wetlands that are becoming inundated by introduced Mute Swans. People are being told that Mute Swans are native and will become extinct if conservationists are allowed to remove them from our wetlands - not true, but people buy into it, because emotions are being manipulated by clever people. As I so often say, if you have a problem with your plumbing, you call in a plumber; there's a problem with the environment - let's call in a trained environmentalist, not someone with a hidden agenda who simply tugs on people's heart strings. Joining the dots again, let's get wildlife and environmental knowledge back into kids' heads through balanced education programs, so that considered judgements can be made by future generations. If our kids are taught the problems of environments with no insects in them, or environments full of non-native species, then they won't need to rely on jackanory websites for their 'information'. More joining of dots - a common thread in much of the above is the issue of native versus non-native, whether it be lawns versus meadows, flower borders versus woodland, Mute Swans versus any number of other species pushed out by them, or mantises versus our native pollinators. Time and time again, introductions of non-native species around the world have caused ecosystems to collapse and species to become extinct. Non-native species clearly cause problems in the vast majority of cases and we need to recognize that and do something about it. We also need to recognize that education through a properly structured curriculum is the way to learn how to protect our embattled planet, not through trite nonsense and deliberately emotional heart tugging on the internet. It's time to start joining the dots. This year's crop of young birds are slowly finding their wings now and late July into August is a great time to study local birds a bit closer and to practice sorting out the youngsters from the adults. In many bird species it can be very difficult - if not impossible - to tell the season's youngsters from their parents unless you have them in the hand but, conversely, many other species can be aged by their plumage - and sorting them out can be a restful thing to do on a balmy summer day. Many young songbirds will have been on the wing for some time as they grow quickly and are soon out of the nest, but young waterbirds and birds of prey are only just stretching their wings now and taking their first tentative flights. Here's a few photos of young birds taken around Cape May this week, with some notes to help you check out the youngsters in your area. Juvenile Laughing Gulls show some features that are typical of the juveniles of many bird species. Most obvious here are the broad, buffy tips to the upperpart feathers. 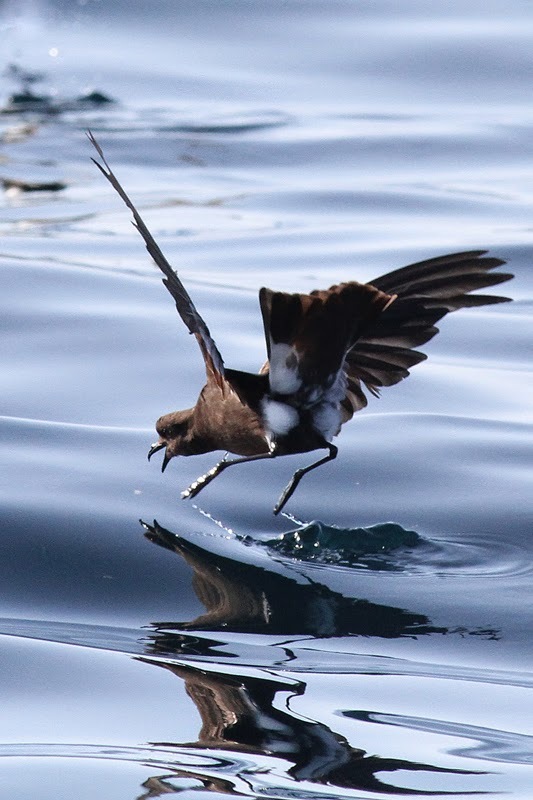 These probably set the young birds apart from the adults visually, so that they can roam freely for a short while without being mistaken for interlopers looking to steal a territory or a partner. The buffy tips subdue plumage markings that would otherwise be seen as a threat or attraction - features that would be dangerous in the hands of one so young! [Photo by Mike Crewe]. 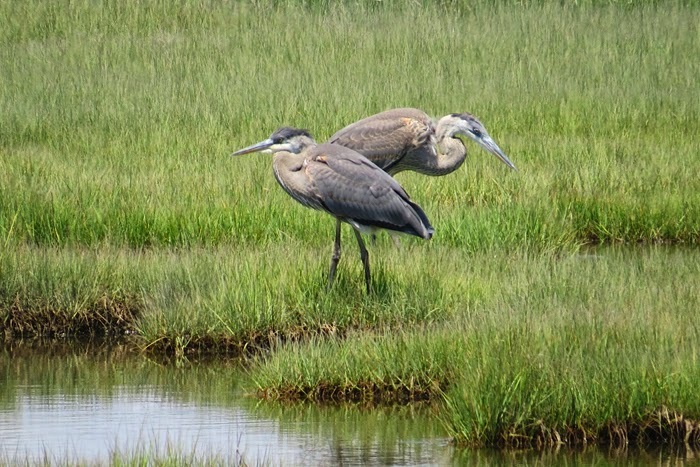 Although Great Blue Herons do not breed with us in Cape May County, they do breed in New Jersey and this year's youngsters are now arriving in the backbay marshes. Note again here, the buffy tips edging the upperpart feathers, as well as the subdued head pattern [photo by Warren Cairo]. Locally hatched and reared, young Forster's Terns are on the wing at Cape May Point now. Again, we see buffy brown tips to the upperparts and a subdued head pattern. As with the Laughing Gulls above, head patterns send powerful signals to potential partners or rivals, so juveniles go straight into a non-breeding type head pattern to avoid needless confrontation. 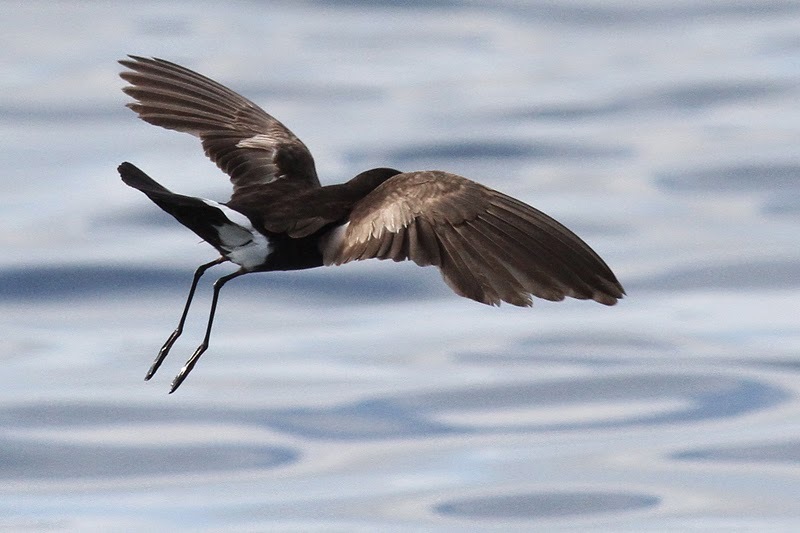 With Forster's Terns, this means a white head with a black 'bandit' mask [photo by Mike Crewe]. If you are on a backbay boat trip, you'll be overloaded with great Osprey photo opportunities. Most nests now contain wing-stretching youngsters, while the more advanced are already taking their first, unsteady flights [photo by Mike Crewe]. That's what I call a nestful! Ospreys typically have two to three young and nests are getting pretty crowded right now. Note in both these pictures the brown-backed adults that contrast with the scaly-backed youngsters [photo by Mike Crewe]. Much preening takes place during molt cycles and new feathers need to be weather-proofed as they grow through. Many bird species (especially waterbirds like this Short-billed Dowitcher) have a gland at the base of the tail that produces a waterproof secretion. Watch carefully and you will see birds collect oil from the gland in their bill and then work it into the feathers while preening. One other cool feature you might notice on this dowitcher is the flexible tip to the bill - note how the two halves are bent outward near the tip here [photo by Mike Crewe]. Location Abbreviations/Explanations: CMP (town of Cape May Point), CMPSP (Cape May Pt. State Park), SCMM (South Cape May Meadows), Cove Pool (boardwalk and adjacent marsh/pools, accessible from the west end of Mount Vernon Ave in Cape May). Numerous observers noted the increasing number of Mute Swans at CMPSP this week. An unfortunate total of 42 was logged there 17 Jul (MH). Gadwall remained a regular sight at CMPSP, SCMM, and Cove Pool through the week. Breeding was confirmed when a hen was seen with 4 ducklings at SCMM 17 Jul (FS). "Scoter Summer" is still going strong around CMP, where as many as 100 Black Scoters and at least 3 Surf Scoters continued to be reported (m. ob.). At least one Wild Turkey was still wandering about CMP, most recently detected along Seagrove Avenue 14 Jul (BR). It was a slow week for seawatching. 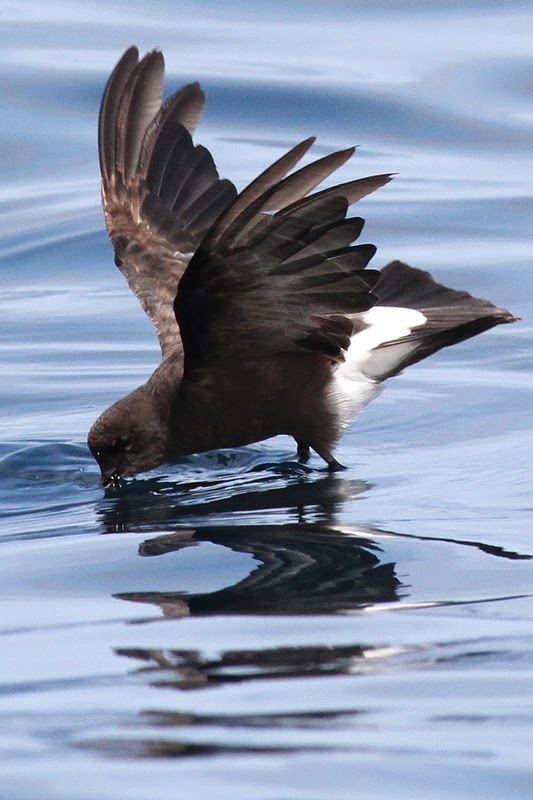 Small numbers of Wilson's Storm-Petrels continued to be reported from shore at Cape Island. Various vantage points at CMP, CMPSP, and SCMM provided views of the species, and reports also came in from ferry crossings (m. ob.). There was a marked decrease in Brown Pelican reports, though one ventured into Delaware Bay as far north as Reed's Beach 14 Jul (TR). The species is irregular and uncommon that far up the bay. 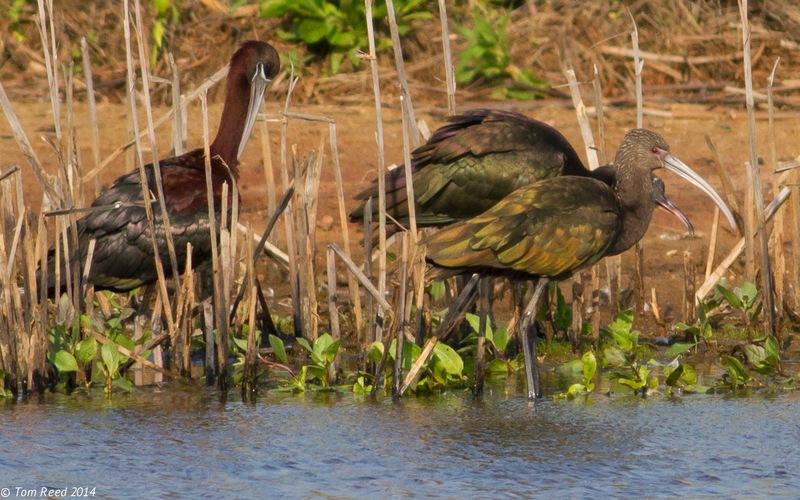 A White-faced Ibis was gleaned from a flock of 102 Glossy Ibis at SCMM 14 Jul (TR), and was seen again 15 Jul (LZ, WC). It has not been seen again. 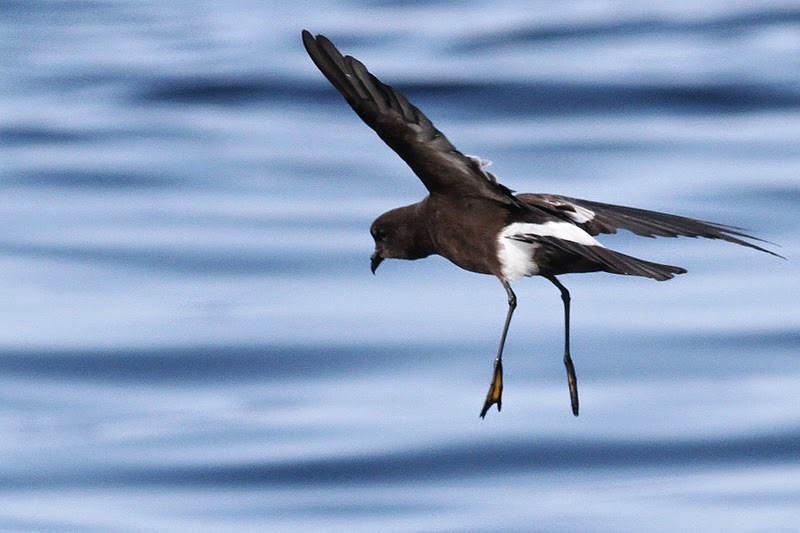 Shorebirds moved past in dribs and drabs throughout the period. Least Sandpiper, Short-billed Dowitcher, and Lesser Yellowlegs were among the more common species migrating south during the last several days. Over 250 Least Sandpipers were counted from SCMM 16 Jul (TR), and 50+ Lesser Yellowlegs zipped by CMP 17 Jul (TR et al.). Whimbrel were moving along both sides of a cold front this week. A total of 31 motored over SCMM during strong south winds ahead of the front 14 Jul (MC, TR), before another 21 navigated past the same site during foggy conditions, just as the front moved through 16 Jul (TR). Less common migrants at Cape Island included a Marbled Godwit over CMPSP 16 Jul (FS et al. ), along with an Upland Sandpiper, 6 Western Sandpipers (TR) and at least 1 Stilt Sandpiper (KL et al.) in or above SCMM the same day. Lesser Black-backed Gulls continued to roam ocean side beaches, and a count of 12 was obtained at SCMM 14 Jul (MO'B). Terns featured prominently again this week. A Sandwich Tern dropped in at Bunker Pond, CMPSP on 18 Jul (WC, m. ob. ), and 2–3 Roseate Terns continued to put in sporadic appearances on the beaches between SCMM, CMPSP, and CMP (m. ob.). 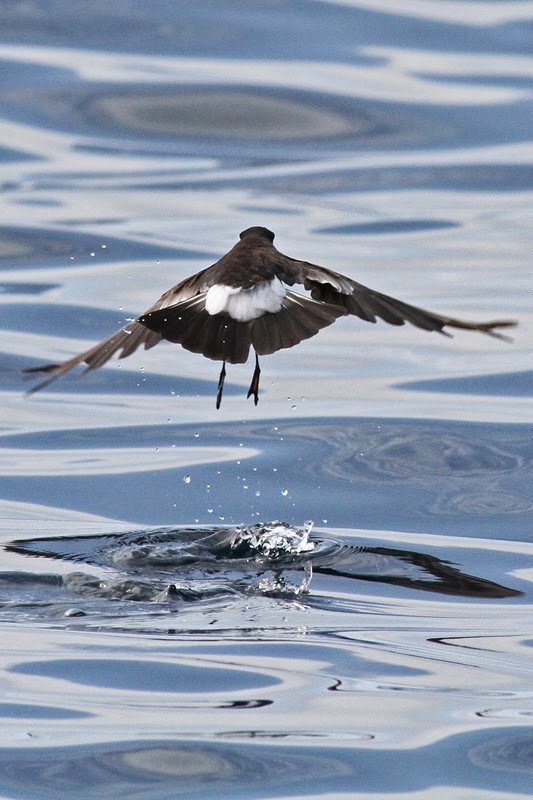 Black Tern should become more regular in coming weeks-- the only recent report was of a single at SCMM on 13 Jul (JC). Caspian Tern will likewise increase through the rest of summer, and several arrived at sites such as Corson's Inlet, Hereford Inlet, and CMPSP in recent days (m. ob.). Gull-billed Tern is generally uncommon at Cape Island, therefore 2 at SCMM 14 Jul, and the same or another there 16 Jul, are worth mentioning (MC, TR). 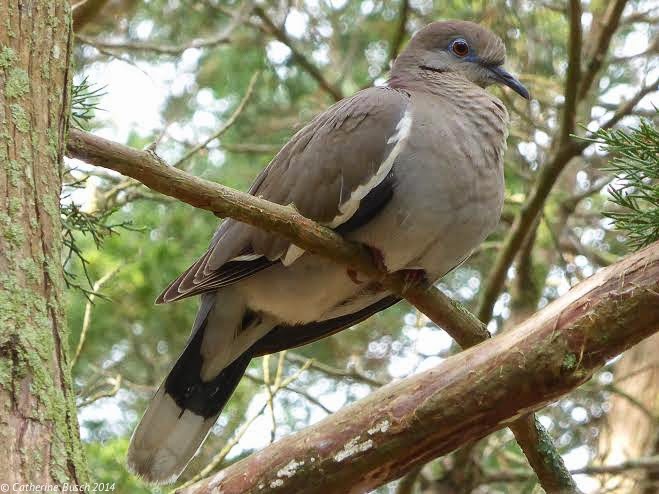 A White-winged Dove was discovered at the corner of Lincoln & Lehigh Aves, CMP 11 Jul and continued in the immediate area through 15 Jul (EO, m. ob.). There have been no reports since. This individual represents the second seen in Cape May County this year. CMP's Eurasian Collared-Dove remained elusive, apart from one sighting of it on the wing near Lighthouse & Seagrove Aves 13 Jul (TR). Willow Flycatcher reports have been sparse in recent days, but 2 were heard at CMPSP 17 Jul (TR et al.). There was a noticeable movement of swallows and songbirds over Cape Island 17 Jul, following the passage of a cold front. Swallow estimates included 10+ Cliff Swallows, 20+ Bank Swallows, and 400+ Barn Swallows. (m. ob.). Songbird migrants included 25+ Yellow Warblers and 20+ Bobolinks (m. ob.). Catherine Busch, Warren Cairo (WC), John Collins (JC), Mike Crewe (MC), Marilyn Henry (MH), Karl Lukens (KL), Emelia Oleson (EO), Michael O'Brien (MO'B), Tom Reed (TR), Bill Roache (BR), Frank Sencher Jr. (FS), Louise Zemaitis (LZ). *eBird. 2012. eBird: An online database of bird distribution and abundance [web application]. eBird, Cornell Lab of Ornithology, Ithaca, New York. Accessed 18 Jul 2014. Available: http://www.ebird.org. Ducks - like you never saw them before! A recurring theme in blog posts this year has been the presence through the summer period of a number of bird species - most notably ducks - that we typically think of as winter visitors. As mentioned before, it seems most likely that these are birds that found weather conditions not conducive to migration at the time in spring when they would normally be heading back north and they just decided to stay further south. This idea is supported to a certain degree by the fact that pretty much all of the over-summering birds are clearly identifiable by their plumage as being second-calendar year birds and thus individuals that would not normally breed this year anyway. 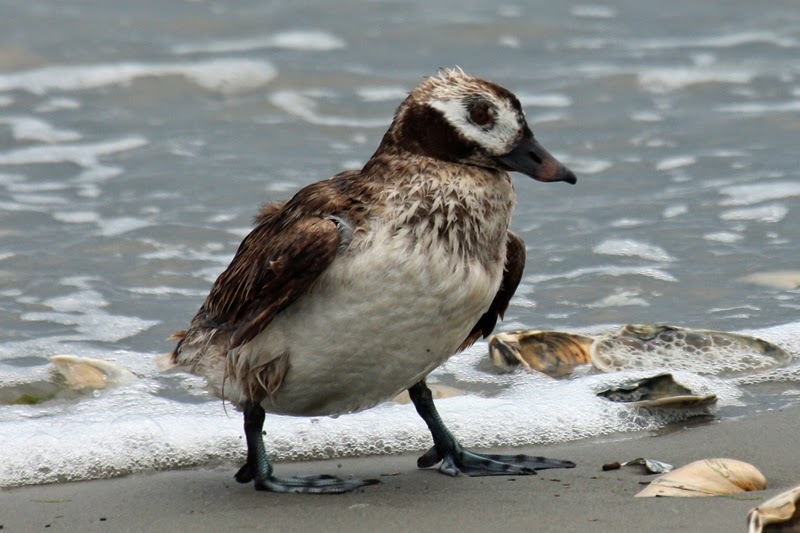 There's no pressing need for them to push all the way north to Arctic breeding grounds so typically they might head north some of the way and perhaps summer off the New England coast or the Maritimes, but this year, Cape May will do nicely! Time constraints (as well as aborted attempts due to the lack of a refuge from tourists for the birds around Cape May) have prevented me from getting photos to build a blog post around these ducks until now; a blustery summer rainstorm gave the birds brief respite and rest on the beach for a short while until Sunset Boulevard was log-jammed with cars and the birds breathed a heavy sigh and headed for the water again. However, the opportunity was taken and I spent a short time studying a party of Black Scoters at a time of year when these birds are not normally that easy to study. One thing that immediately strikes you about ducks in summer is how scruffy and unkempt they look. Something else also strikes you quite quickly - they appear to have no wings!! This latter point is explained by the fact that most ducks, geese and swans molt all of their flight feathers (and often tail feathers) in one go, a strategy that renders them flightless for a few weeks. 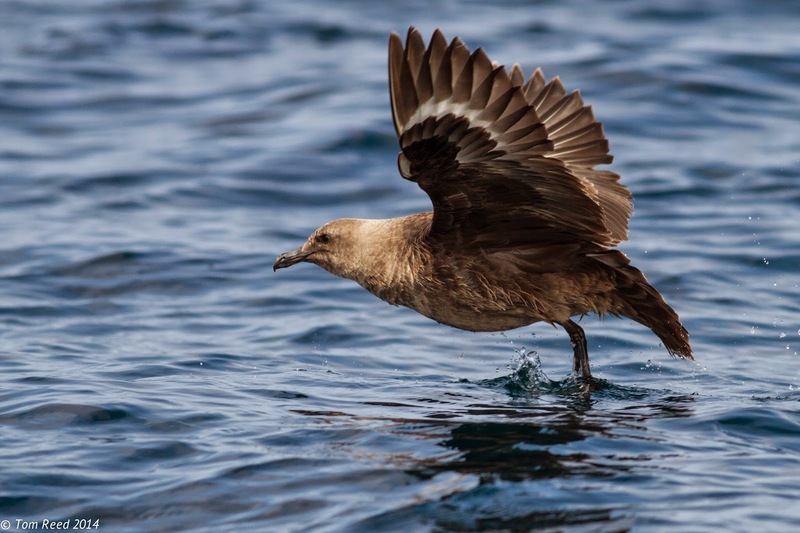 For most birds this would be suicide; most birds use flight as a quick get-away from potential danger, so they molt their flight feathers in sequence, usually starting in the middle of the wing and molting one or two at a time toward the two ends. This allows them to retain the power of flight throughout. Waterfowl, however, gain protection from most potential predators by simply staying out on the water, so can afford to dump a whole bunch of feathers in one go and get the whole messy business of molting out of the way as quickly as possible. Cape May Point's summering Black Scoters (there's a few Surf Scoters around too) also make for some identification challenges. Look closely at this female and you can pick out the blacker-looking new feathers from the raggedy and faded brown ones. 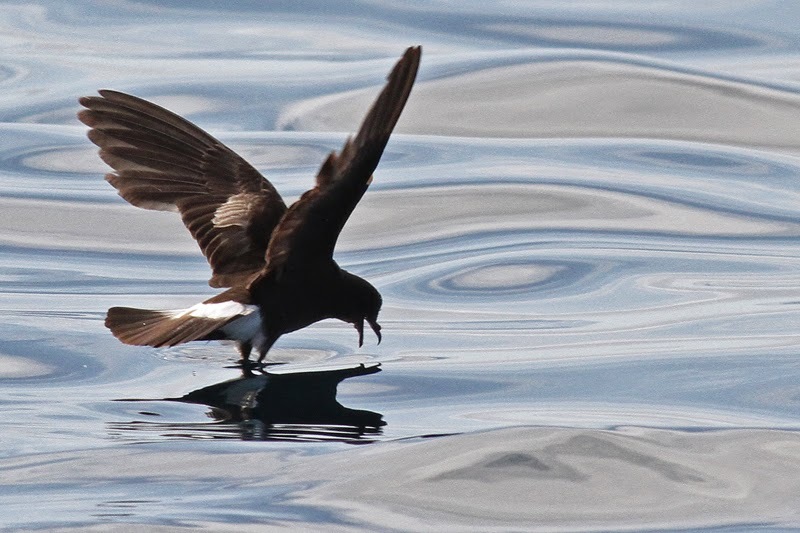 The molt process can render the birds less waterproof than usual, which is why they like to spend time ashore if they can get it. On this bird, you can see a large pale patch on the wing, formed by the shafts of the new primary feathers which are just growing through. Recent reports of White-winged Scoters at the point probably originate from confusion caused by this pale patch on the Black Scoters. At this time of year, White-winged Scoters would have no secondaries - so no white wing! If you have a pond or park nearby, check out the local Canada Geese right now and you will probably see the same bundle of feather shafts coming through on the wings [photo by Mike Crewe]. Something else you seldom see - the huge feet of Black Scoters! Diving ducks need big flippers to aid underwater swimming, but it does make them rather ungainly on land [photo by Mike Crewe]. If you have over-summering ducks near you, check them out regularly over the coming weeks and you will see the gradual change as flight feathers grow back in and the plumage becomes less patchy as old, worn feathers are replaced by crisp, new ones. By now, many of us will know of the amazing feats of endurance that migratory birds go through, but as each tale comes in, it still manages to amaze us. 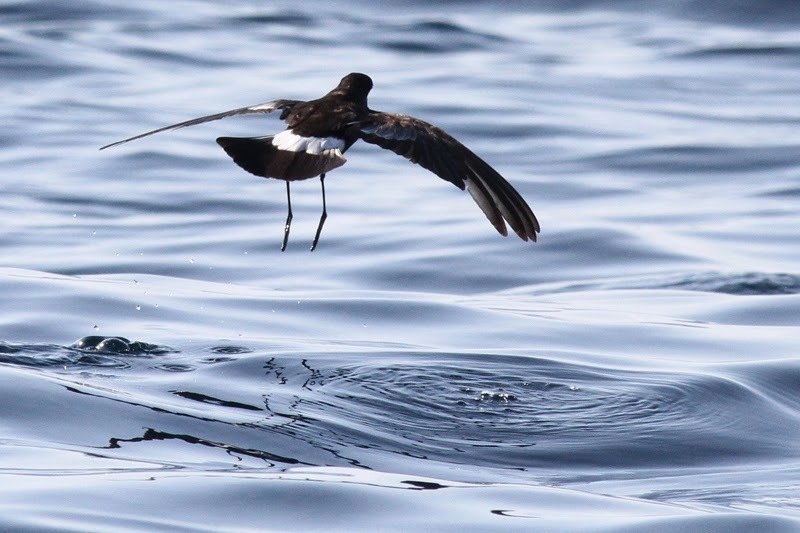 As technology continues to improve, we are finding more and more ways to gain insights into the movements of migratory birds, supplying us with invaluable data which allows us to make well-infomed decisions when it comes to helping declining populations. Biologists from Manomet Center for Conservation Science, New Jersey Audubon, U.S. Fish and Wildlife Service, Kansas State University, the Wildlife Conservation Society, the Canadian Wildlife Service, Simon Fraser University, the Government of Nunavut, and Université de Moncton have coordinated the first effort to use geolocators to understand the migratory pathways of this species. Geolocators record changes in ambient light levels, especially the rapid changes apparent at sunrise and sunset. Typically, daylight length is used to determine latitude, while the midpoint between sunrise and sunset is used to determine longitude. Recording light levels over time produces data that can be used to estimate locations of a bird throughout the year. To retrieve data from a geolocator, the bird must be recaptured. Analysis of the data from the geolocators is key to understanding what the tiny units have recorded during the past year. The map [below] shows the first ever track of an entire year in the life of a Semipalmated Sandpiper from the eastern Arctic, the population which appears to have decline significantly over the last 30 years. This particular bird, a male, flew a total distance of ~16,500 kilometers, (~10,300 miles) in the past year. 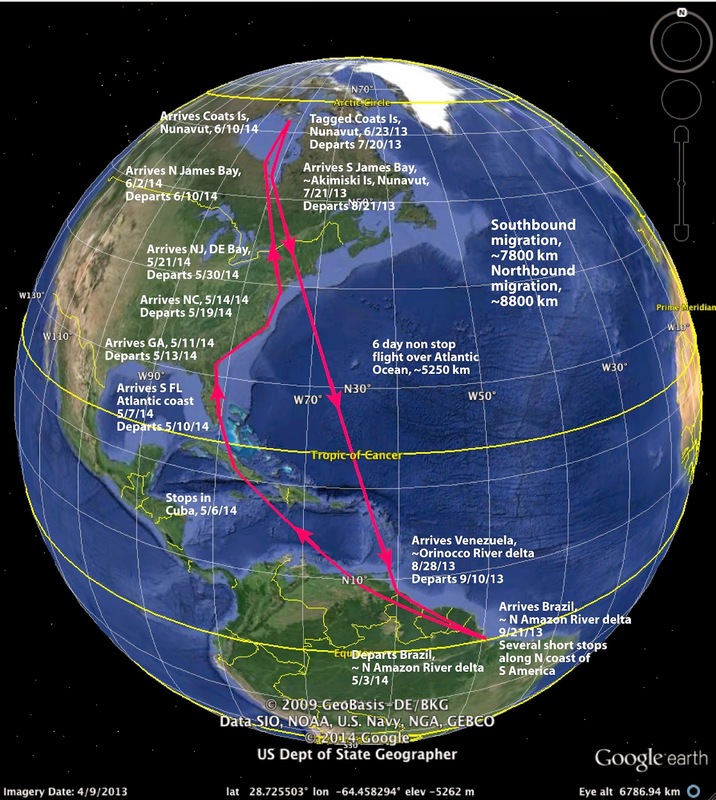 He also made a remarkable six day, 5,250 kilometer (nearly 3,300 miles) nonstop flight across the Atlantic Ocean from James Bay to South America, before moving on to his wintering area in Brazil. You can help!! Adult Semipalmated Sandpipers will be returning through our area in the coming weeks, with juveniles appearing through September and October. Keep a close eye on birds and report any that you find wearing colored leg flags, taking care to record the alphanumeric symbols as accurately as possible. Sightings can be reported via the bird banding website and your reports will go toward providing researchers with valuable data on these birds [photo by Mike Crewe]. Location Abbreviations/Explanations: CMP (town of Cape May Point), CMPSP (Cape May Pt. State Park), SCMM (South Cape May Meadows), Cove Pool (boardwalk and adjacent marsh/pools, accessible from the west end of Mount Vernon Ave in Cape May), WMA (Wildlife Management Area-- Tuckahoe). A disturbingly large congregation of Mute Swans remained at Tuckahoe WMA this week, with 54 individuals counted there 8 Jul (CB, CM). CMP's summering Black Scoter flock still numbered between 80–100 individuals through the period, along with at least 3 Surf Scoters (m. ob.). A Red-breasted Merganser, also summering locally, was again reported from Jarvis Sound 6 Jul (SGa). Gadwall continued to be reported on a daily basis from Cove Pool, SCMM, and CMPSP, with a maximum of 7 at SCMM on 8 Jul (VE). Evidence of breeding at these sites remained elusive. 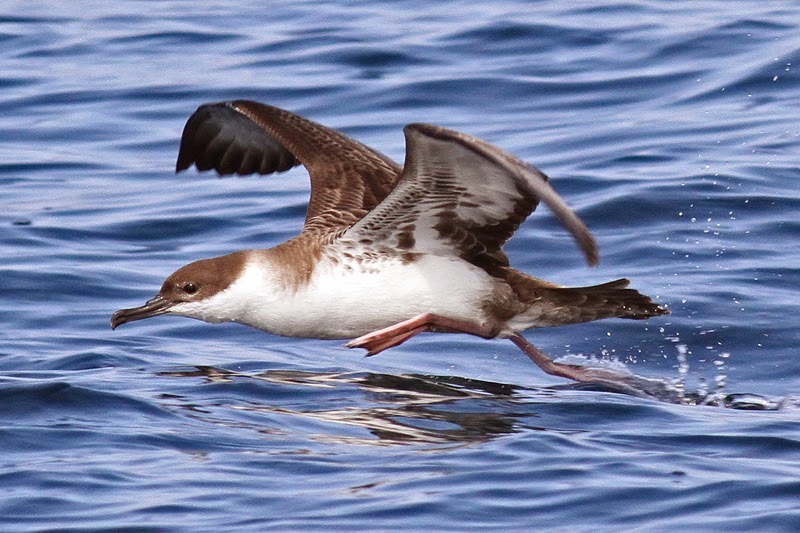 Another land-based report of Great Shearwater was logged this week, when one flew south past Sunset Beach 9 Jul (m. ob.). 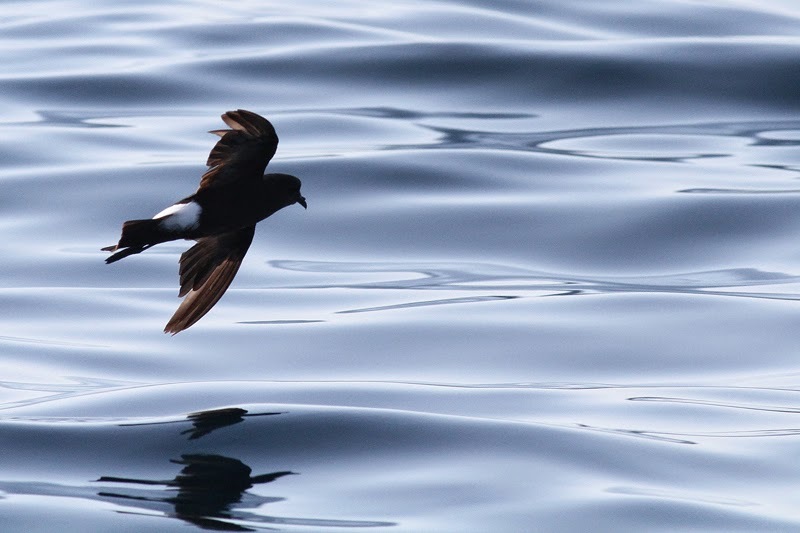 Wilson's Storm-Petrels continued to be seen in small numbers from CMP, and 7 were tallied during the New Jersey portion of a ferry crossing 10 Jul (JS). Occasional reports of Brown Pelicans continued to trickle in as the week progressed; the period's max of 6 was notched at Poverty Beach on 6 Jul (AC). 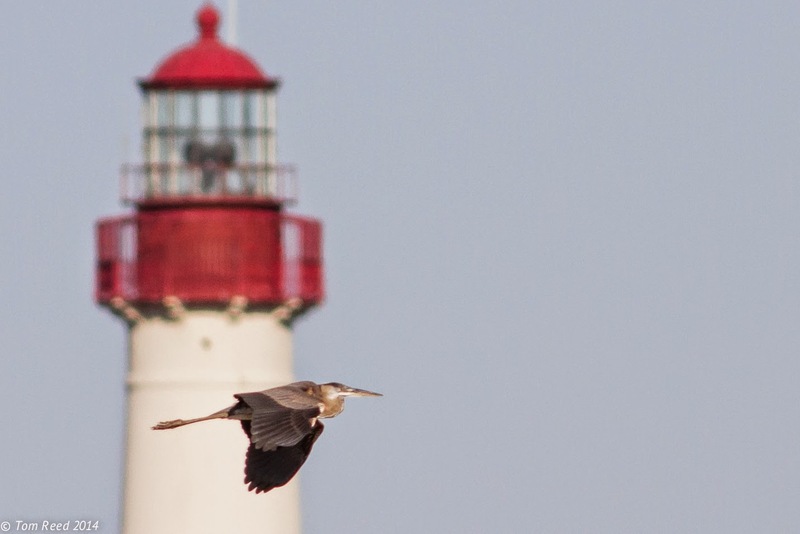 Great Blue Herons are largely absent from Cape May County during late-spring and early-summer, but apparent southbound migrants start to appear in Jul as demonstrated by 9+ over CMP on 5 Jul, following the passage of a cold front (TR et al.). Jul also likely serves as the peak for Glossy Ibis migration-- 150+ headed south past Cape Island 5 Jul (TR et al.). A Mississippi Kite over SCMM and CMP 5 Jul was undoubtedly a product of northwest winds (m. ob.). Piping Plover continues to struggle mightily this summer, with just a single pair still attempting to nest in the county as of 11 Jul (NJDFW). 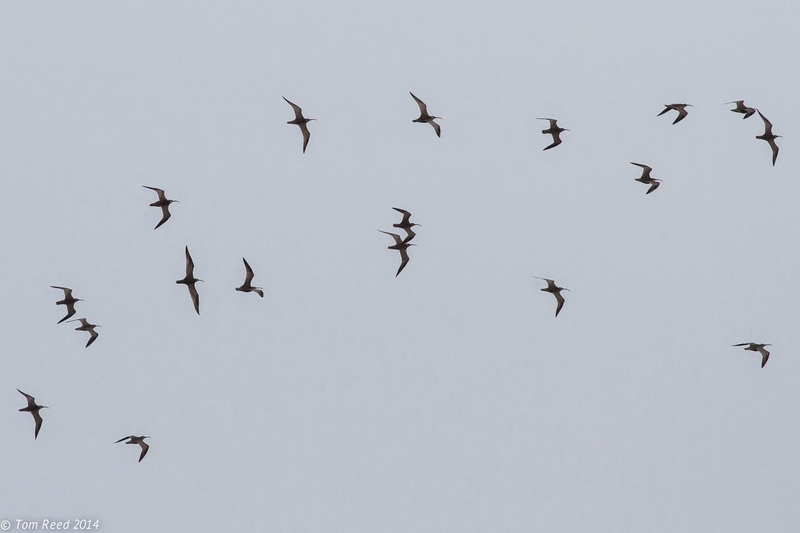 On a happier note, shorebird migration picked up the pace this week. Southbound American Avocets were exceptional on multiple days at Cape Island. A brace was observed fleeing Cove Pool toward Delaware 8 Jul (DW), followed by a trio over SCMM 10 Jul which eventually exited toward the west (WC, AC). Northerly winds produced a light but steady flight of shorebirds at SCMM 9 Jul, including 42 Lesser Yellowlegs and 48 Short-billed Dowitchers (SR). The next day, rainy conditions teamed up with northwest winds to produce another morning movement that included 30+ Whimbrel, 40+ Lesser Yellowlegs, 60+ Short-billed Dowitchers, and 100+ Least Sandpipers over SCMM 10 Jul (m. ob.). Upland Sandpiper has unfortunately become a scarce fall migrant at Cape May, therefore one was a most welcome sight in the dunes at SCMM 5 Jul (VE, m. ob.). The season's first Stilt Sandpiper flew over West Cape May 9 Jul (MO'B). 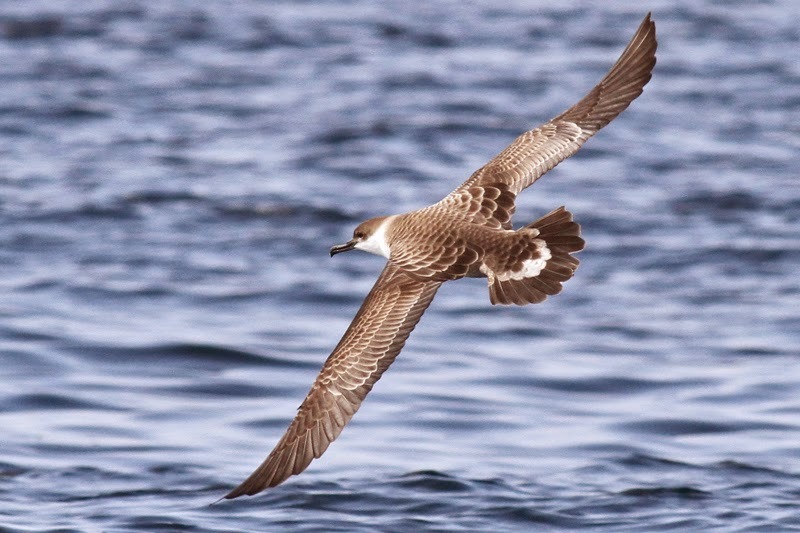 Increased numbers of gulls and terns were feeding in "the rips" offshore CMP this week, and this influx likely drew in a slightly unseasonal Parasitic Jaeger, reported from the Coral Avenue dune crossover 8 Jul (SGl). Scattered Lesser Black-backed Gulls continued to occupy beaches along the ocean side and at Cape Island, including 6+ encountered at SCMM in recent days (m. ob.). Terns were also in the news this week. The year's first Sandwich Tern, an adult, was photographed at SCMM 7 Jul (m. ob. ), and the same or another was noted at CMP 9 Jul (MK). Rare in Delaware Bay north of Cape Island, another Sandwich Tern put in a brief appearance at Reed's Beach 8 Jul (TR). At least 2 Roseate Terns played hide-and-seek with birders between SCMM and CMP through the week, and a Black Tern visited CMPSP 8 Jul (SGl). Tuckahoe WMA continued to host Gull-billed Terns on a regular basis, and at least 4 were studied in the impoundments there 8 Jul (CB, CM). After a lengthy absence, a/the Eurasian Collared-Dove surfaced at CMP this week, with the most recent report coming from the corner of Lehigh & Lincoln Avenues 11 Jul (WC, m. ob.). Observers are encouraged to continue reporting any sightings of this species. Cliff Swallow occurrences in Cape May seem intensely tied to westerly winds-- 8+ were found at SCMM and CMPSP during strong northwest winds 5 Jul (m. ob.). New Jersey's 4th Brown-headed Nuthatch briefly made its presence known at the Coral Avenue dune crossover, CMP 5 Jul (MO'B, LZ). It has not been reported since. Perhaps not surprisingly, all New Jersey records of this southern species have occurred at CMP, and 3 have been discovered in the dune-top pines along the bay side of town. Southbound songbird migration is just starting to fire up. The aforementioned cold front produced a few migrants over SCMM and CMP 5 Jul, including 9 Indigo Buntings and 4 Bobolinks (m. ob.). Single Bobolinks were also noted flying over Reed's Beach 6 Jul and 11 Jul (TR). Catherine Busch (CB), Warren Cairo (WC), Alan Crawford (AC), Vince Elia (VE), Sam Galick (SGa), Steven Glynn (SGl), Mark Kantrowitz (MK), Karl Lukens, Christina Marks (CM), NJDFW (New Jersey Divison of Fish & Wildlife staff), Michael O'Brien (MO'B), Tom Reed (TR), Steven Rodan (SR), Jeff Shenot (JS), Daniel Weeks (DW), Louise Zemaitis (LZ). *eBird. 2012. eBird: An online database of bird distribution and abundance [web application]. eBird, Cornell Lab of Ornithology, Ithaca, New York. Accessed 11 Jul 2014. Available: http://www.ebird.org. Clapper Rails are abundant in Cape May's backbay marshes, but can be a nightmare to see. Drifting quietly in a kayak is the ideal way to get up close and personal with them [photo by Beth Polvino]. American Oystercatchers can readily be seen around Cape May County, either nesting on the few fragments of protected beach, or feeding in the muddy back bays at low tide. 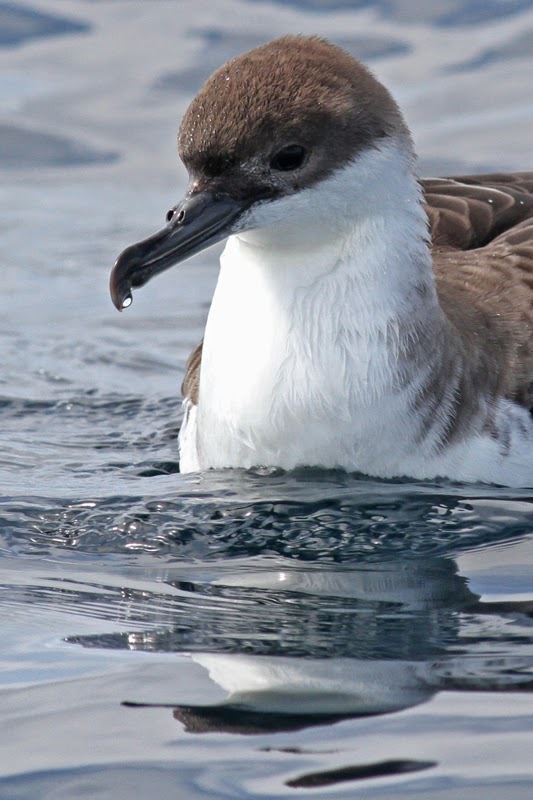 Close up views from a boat can not only provide great photographic opportunities, but will also help you to help conservation by recording numbers on banded birds [photo by Beth Polvino]. Don't forget that there is more than just birds out there. Diamondback Terrapins are the only terrapin we have that habitually lives in saltwater and will almost certainly be the species that you will see in the back bays [photo by Beth Polvino]. 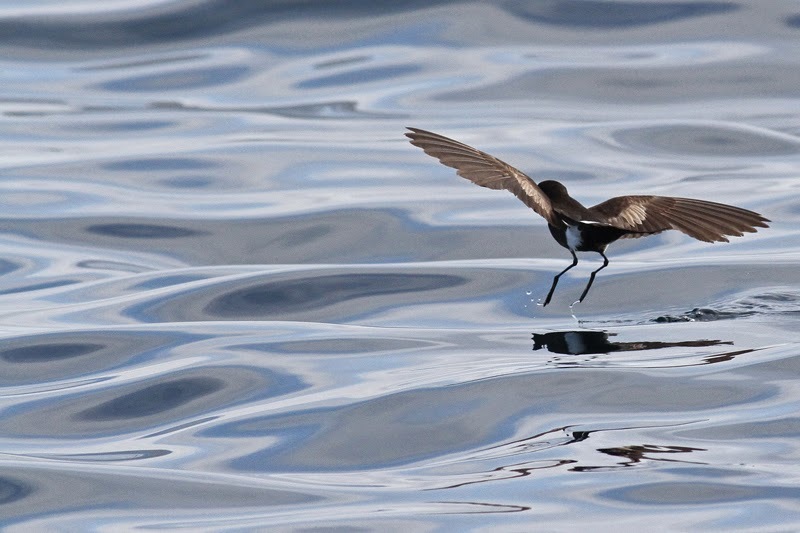 If you are not in the mood for a boat trip, there's plenty of other birding opportunities. The Nature Conservancy's South Cape May Meadows, off Sunset Boulevard continues to atract migratory shorebirds and other wetland species. Two American Avocets dropped in there briefly on Tuesday, while Virginia Rails continue to be reported on occasion (at least one pair bred there this year). Short-billed Dowitchers, Lesser and Greater Yellowlegs, Least Sandpipers and Glossy Ibises continue to fly through and a scattering of Black-crowned Night Herons, Spotted Sandpipers and others can be found on the pools there. The South Cape May Beach is attracting a variety of terns, with Royal, Sandwich, Black and Roseate all appearing recently among the Least, Forster's and Common Tern flocks there. Nothing brings out the insane streak in a birder more quickly than the suggestion of a hurricane. While personal health and safety clearly have to be taken into account, your average birdwatcher on the East Coast of the USA (OK, your beyond average, somewhat obsessive birder!) reacts very differently to the average person when news of a hurricane comes over the air waves. Hurricane Arthur ensured that the windy season started early at Cape May this year and it was very unfortunate for tourists and local tradesmen that this storm decided to head our way right on Independence Day. Dangerous rip currents and driving rain are not ideal components of a day at the beach but, as it turned out, Arthur decided to let us off lightly here and stayed far enough out to sea that its effects were very muted compared with what they might have been. Eastern Willets were the majority species noted off Sunset Beach during the passing of Hurricane Arthur. Small parties will have been moving south at this time of year and no doubt a few got turned around and disorientated during the worst of the weather [photo by Mike Crewe]. A small bonus for those who braved the weather was a light passage of Whimbrel, all heading north up the Delaware Bay - perhaps simply because flying into a northerly wind is easier than flying with it on your tail. 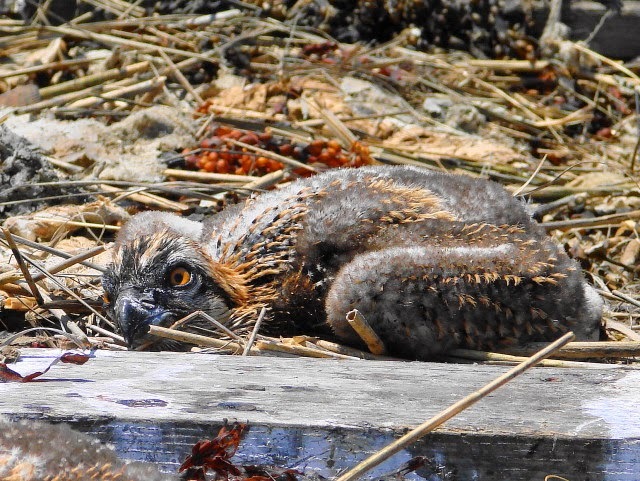 This individual dropped in and fed on the beach for about an hour during the worst of the weather [photo by Mike Crewe]. Post Arthur, the weather has returned to sunny and very pleasant - though mornings have been decidedly cooler than they were last week. 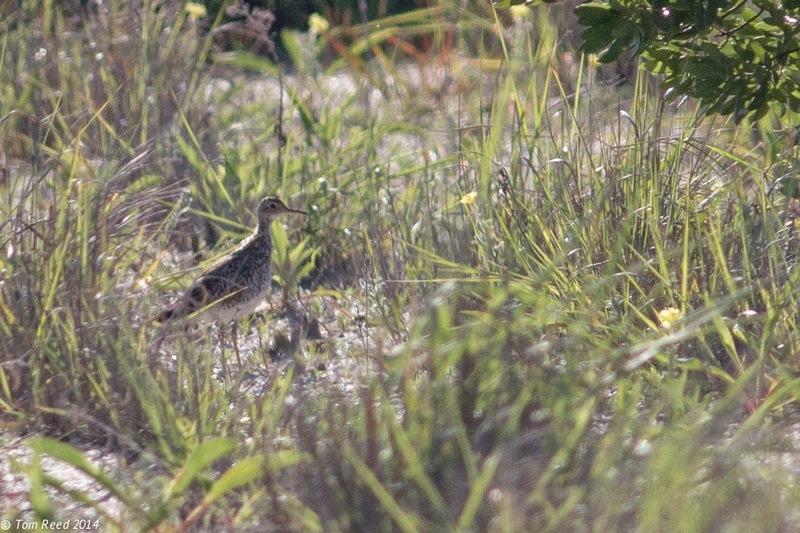 An Upland Sandpiper lurking in the dunes on Saturday got a few people out into the field and an interesting early fall passage of birds was found to be taking place. Indigo Buntings and Bobolinks, a Mississippi Kite and an array of shorebirds were all noted, while two Cliff Swallows passing west along the dunes were very unexpected in early July. In the coming days, expect more and more shorebirds to be passing through; at this time of year, most of them will be adults and many will likely still be in breeding plumage. Fall migration has begun! Location Abbreviations: CMP (town of Cape May Point), CMPSP (Cape May Pt. State Park), SCMM (South Cape May Meadows), WMA (Wildlife Management Area-- Cox Hall Creek, Tuckahoe). At least 80 Black Scoters remained around CMP through the period, along with 1-2 Surf Scoters (m. ob.). 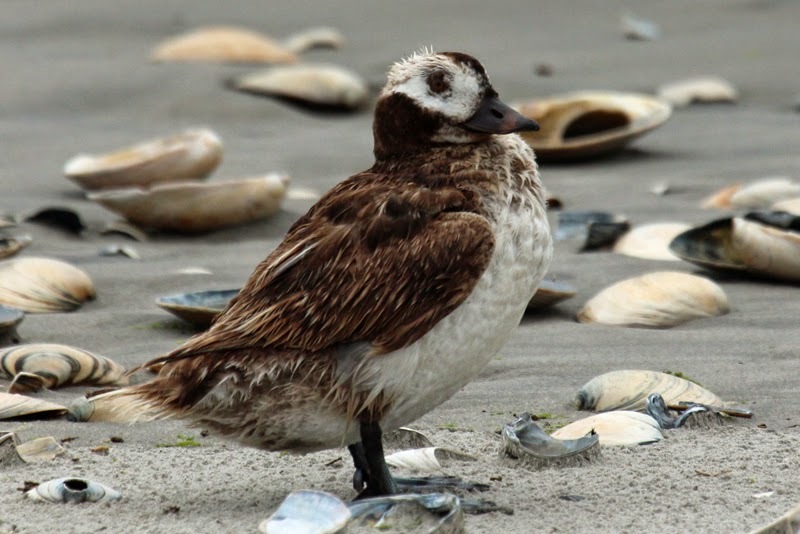 A Ruddy Duck appeared at CMPSP 1-2 Jul, an unseasonal but not unprecedented date (JA, m. ob.). Gadwall sightings continued to roll in from SCMM and CMPSP on a daily basis, though confirmation of breeding remained elusive (m. ob.). Common Loons were again noted offshore SCMM and along the Intracoastal Waterway on several days (m. ob.). Notable at CMP, at least one Wild Turkey remained near Seagrove Avenue through at least 3 Jul (MG, KL). 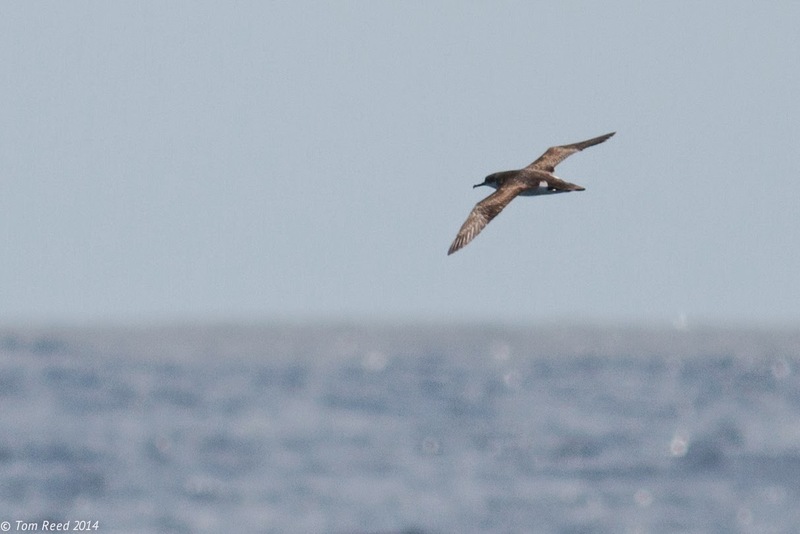 An impromptu pelagic trip crossed paths with a South Polar Skua about 30 miles east of Cape May on 30 Jun (MeC, MiC, MF, TR). This apparently represents just the second county record of the species. 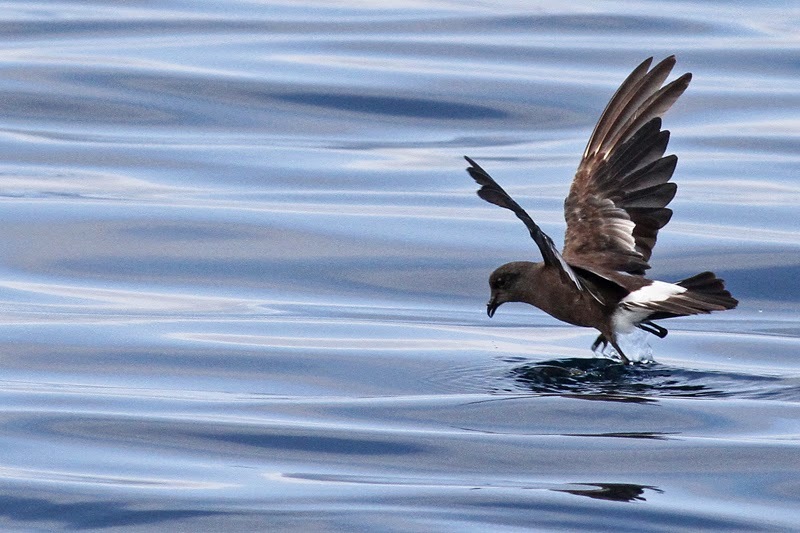 That same voyage also recorded 95 Wilson's Storm-Petrels, 6 Great Shearwaters, 2 Cory's Shearwaters, 2 Manx Shearwaters, and 2 Parasitic Jaegers. Hurricane Arthur stayed well east of Cape May as it moved past the area 4 Jul. 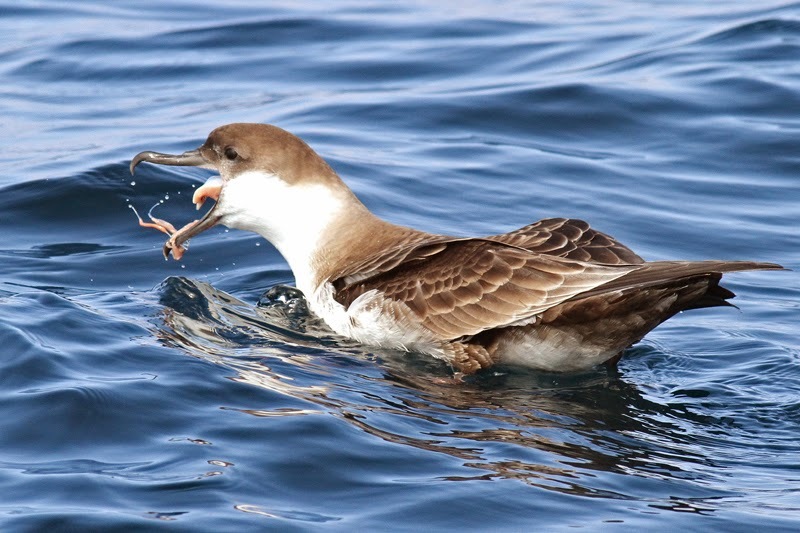 As expected, the storm did not produce any vagrant seabirds locally. Brown Pelican continued to be seen on a near-daily basis-- the period's high count of 9 was notched at SCMM 30 Jun (m. ob.). An exploration of salt marshes in the northern half of the county turned up male Northern Harriers at Jake's Landing, Stipson's Island, and Tuckahoe WMA on 1 Jul (TR). 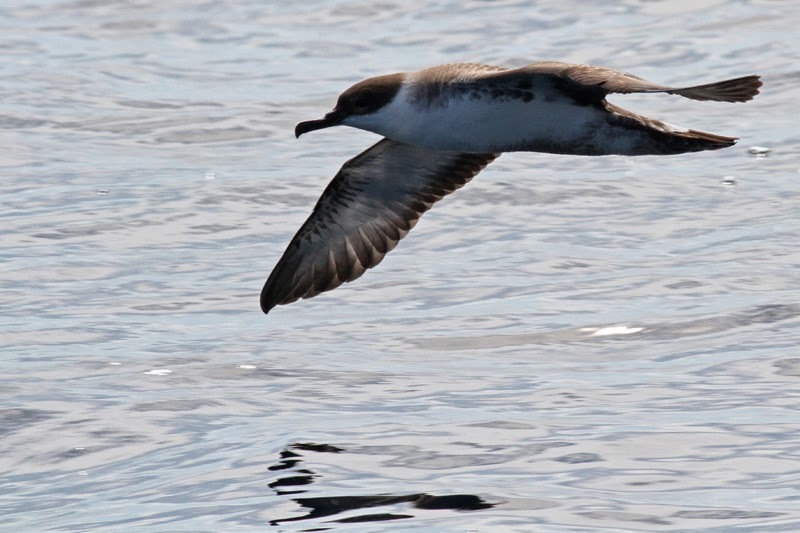 [ABOVE: South Polar Skua, BELOW: Manx Shearwater. Piping Plover continues to struggle, with 3 pairs or less still nesting in the county this week (NJDFW). Southbound shorebirds started to trickle in. Some examples included 4 Spotted Sandpipers at SCMM 2 Jul (SR), 10 Whimbrel at Sunset Beach 4 Jul (MiC et al. ), and 119 Willets over Reed's Beach 4 Jul (TR). 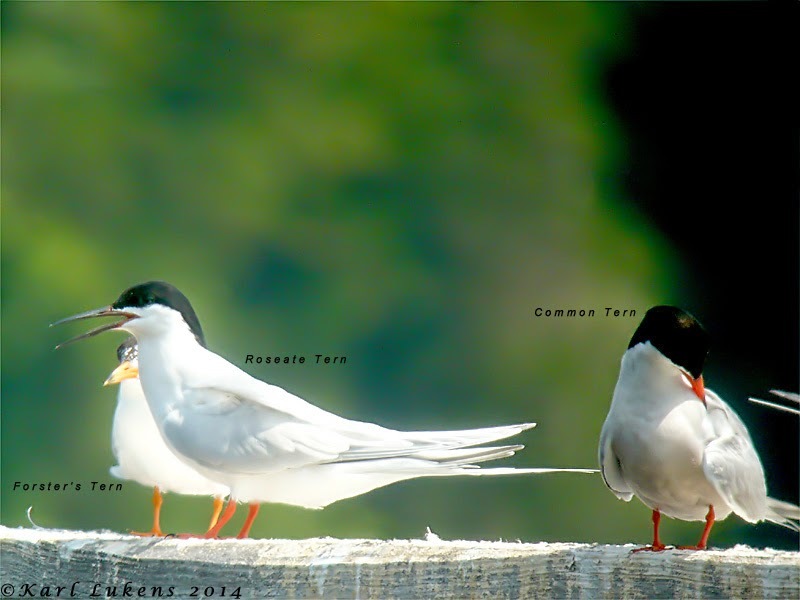 A Roseate Tern was seen between CMP and SCMM 4 Jul (TB, m. ob.). At least 2 Black Terns appeared at CMP during strong southerly winds 3 Jul (MeC, MiC), and another was observed at SCMM 4 Jul (m. ob.). Royal Tern remained a low-density but regular visitor to the ocean side and Cape Island (m. ob.). Peculiar for the date was a Yellow-throated Vireo at Cox Hall Creek WMA 30 Jun (KH). The species has not been known to nest in the southern half of the county during recent years. A small influx of swallows, including 100+ Tree Swallows and multiple Bank Swallows, occupied CMP during the passage of a cold front 4 Jul (m. ob.). A Yellow-throated Warbler was singing again at CMPSP 3 Jul (MG, TR). Jesse Amesbury (JA), Tom Baxter (TB), Megan Crewe (MeC), Mike Crewe (MiC), Vince Elia (VE), Mike Fritz (MF), Mark Garland (MG), Kathy Horn (KH), Karl Lukens (KL), NJDFW (New Jersey Divison of Fish & Wildlife staff), Tom Reed (TR), Steven Rodan (SR). eBird. 2012. eBird: An online database of bird distribution and abundance [web application]. eBird, Cornell Lab of Ornithology, Ithaca, New York. Accessed 4 Jul 2014. Available: http://www.ebird.org. 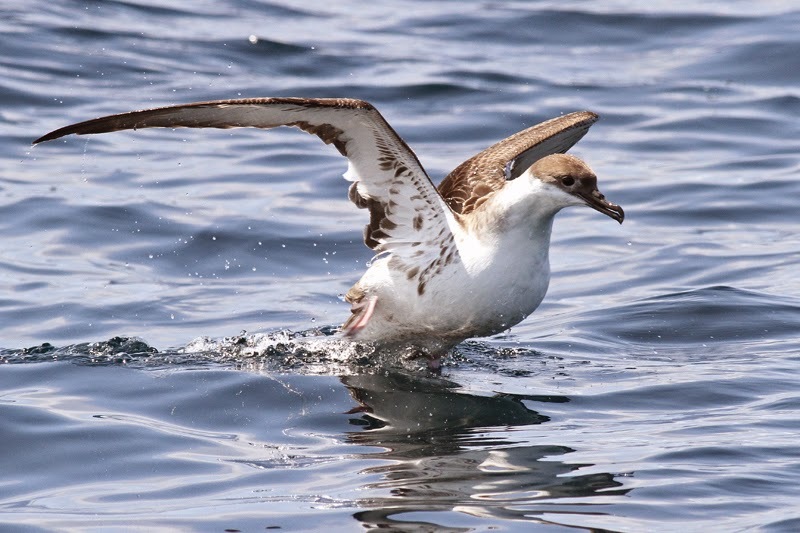 Our last post featured photos of some of the seabirds that are hanging out in our offshore waters right now and several comments posted to facebook and the NJ birds list serve suggest that there may be a number of folks interested in taking a similar trip to the one that we enjoyed on Monday. 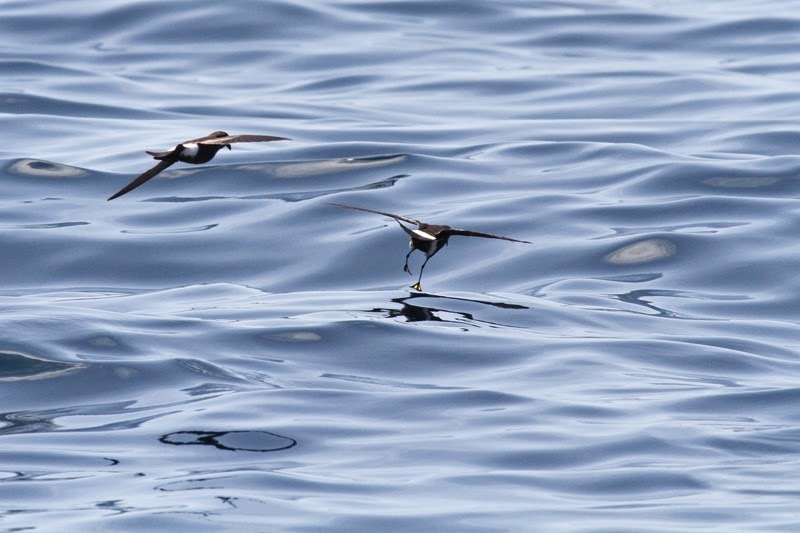 While birds can, of course, never be guaranteed, high summer can certainly be an interesting time out there so it seems to me that, if there is enough interest, we may well look at arranging some short trips offshore to see what we can find. 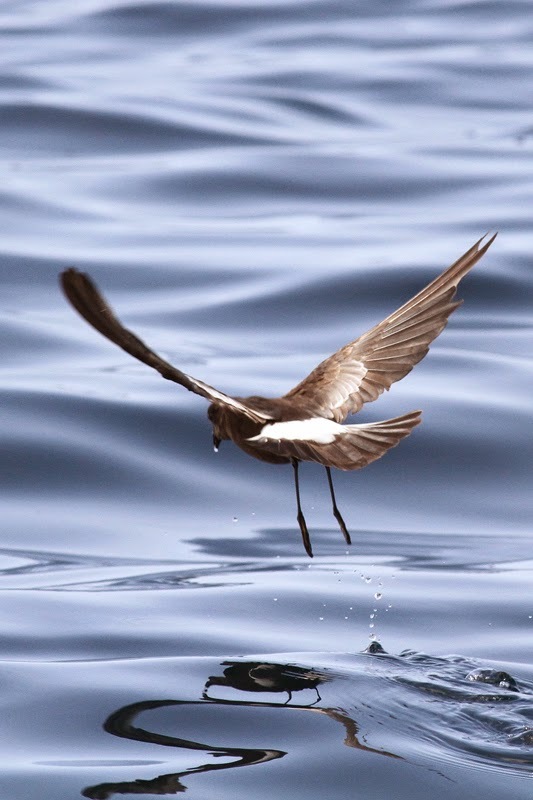 If you are looking to get good numbers of birds and a relatively high chance of seeing something really good, then we suggest you consider some of the established companies such as our friends at See Life Paulagics, who have a well structured calendar of trips further offshore to the edge of the Continental Shelf. But our experience on Monday showed that there are certainly birds of interest closer to land and there may be future opportunities to enjoy them with fellow birders. 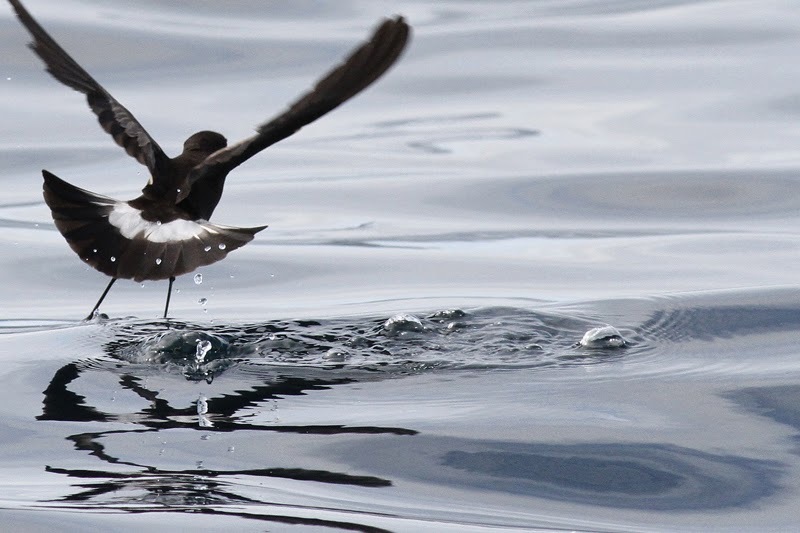 So, if you are interested in enjoying the company of a few seabirds with a small, like-minded group of folks, email us and let us know and we'll see what the possibilities might be. If nothing else, the experience of photographing seabirds at close quarters, in their own habitat offers some wonderful artistic opportunities - as a tempter, here's a photo gallery from Monday that is a blatant piece of oneupmanship. Sometimes you don't want your birds as scientific entities to be identified to the species level. You just want lasting memories of that moment in time that you shared space with them, in their world.